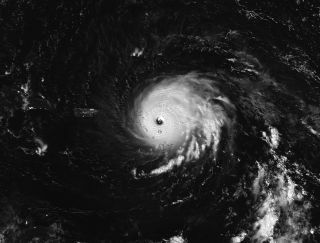 The NASA-NOAA Suomi NPP satellite captured this nighttime view of Hurricane Irma over the Leeward Islands on Sept. 6 at 1:35 a.m. EDT (0535 GMT). Puerto Rico is to the storm’s left. The world's second-largest radio telescope has apparently weathered the storm. The Arecibo Observatory in Puerto Rico is still standing, and still seemingly intact, despite experiencing the wrath of powerful Hurricane Irma, which battered the island last night (Sept. 6). Arecibo, which features a 1,000-foot-wide (305 meters) radio dish, closed earlier this week to prepare for Irma, one of the most powerful Atlantic Ocean storms ever recorded. The Category 5 hurricane is expected to take a northward turn soon, and it could slam into Florida this weekend, forecasters say. Arecibo will remain closed until it's safe to resume operations, observatory representatives have said. Things could have been worse for Arecibo, and the rest of Puerto Rico. Though Hurricane Irma pounded the island with strong winds and heavy rains, it was a glancing blow; the storm's eye, around which the fastest winds of a hurricane swirl, passed north of Puerto Rico. The huge Arecibo Observatory in Puerto Rico. Arecibo came online in 1963. Since then, astronomers have used the observatory for a variety of purposes, from imaging asteroids to mapping water ice on Mercury to searching for possible signals from intelligent extraterrestrials. In 1974, scientists famously used Arecibo's dish to beam a message toward the globular cluster Messier 13 in an attempt to communicate with any aliens who might reside there. Arecibo was the largest single radio dish in the world for more than half a century, until China's Five-hundred meter Aperture Spherical Telescope (FAST) became operational last year. The Arecibo Observatory is a U.S. National Science Foundation facility. It's operated by SRI International, the Universities Space Research Association and Puerto Rico's Metropolitan University.